In 1998 the web allows Philippe Menhinick to rediscover his grandfather’s boat owner from 1948 to 1952. The yacht is in a bad state, but Philippe Menhinick decides to buy it and take it to Saint-Coulomb for a complete restoration. The advertisement on the web informs of the sale of a wooden ketch built in 1934, an unknown English architect and some photographs. Philippe went to see the yacht and discover the name of NAN. He remembers that his grandfather G.H.Menhinick had been owner of a sailing yacht of the same name. Philippe consults the Lloyd’s Register dated 1949 which indicates NAN drawn & built by William Fife junior, G.H.Meninick owner. The coincidence is strange and Philippe decides to go to Cap d’Agde to see the ketch. He takes some photographs and contacts two crew member of his grandfather to clarify that the yacht his really his grandfather’s. It remains for Philippe Menhinick to find the original drawings. In a Lloyd register he discover the name of the first owner Tomas Burrowes and decides to inquire for some eventual descendants. Thanks to luck, Philippe called a Mr Burrows who wasn’t a descendant of Thomas but was very interested in the story : after a week of enquiry he told him to get in contact with the maritime Museum of Irvine in Scotland. It’s where he finaly find the original drawings. With those precious documents he decide to rebuilt NAN as original. 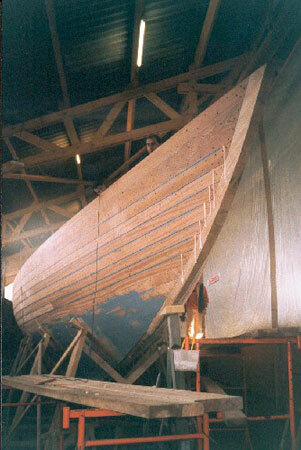 Philippe asked an estimate to fairlie restoration shipyard, the specialized shipyard for the renovation of the Fife’s. The estimate was far to much for what he could afford, so he decided to do it himself with some help of professionals. Philippe created his own shipyard with the help of marine carpenter, a cabinet maker and a assistant carpenter. It is in a shed of a farmer in Saint-Coulomb that the work started. Tuiga ancestor is in a bad state. It’s restoration started on the 17th September 1999 and it took 22 months to be ready to sail. The frames are in oak : every piece of wood has been selected taking into account the curve of the yacht; they are 70 mm width and are doubled – the steamed frames are in acacia. The end of the planking in November 2000 was a great moment. The paint has been done in 2001 after finishing the caulking. The fittings of the interior had a very special care by the cabinet Maker before being varnished. The deck in plywood of 15 mm thickness is recovered of 22 mm of Oregon Pine nailed and glued on the plywood. NAN has left the yard to go to Atelier Bretagne Nord where the lead keel has been fixed. 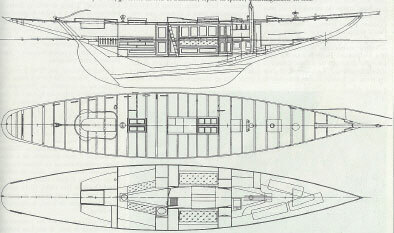 The yacht is now such as it left Fairlie’s yard in Scotland in 1896. Come and admire NAN and take advantage to sail on board of this unique lady more than a hundred years old.